What would be the point of having this job if I didn't get to make up some of the maddest possible scenes I've ever had in my head since I was a kid? 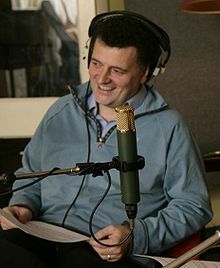 Steven Moffat (born 18 November 1961) is a Scottish television writer and producer, who is currently lead writer and executive producer of Doctor Who, as well as a primary writer on Sherlock. When you run with the Doctor, it feels like it'll never end. But however hard you try you can't run forever. Everybody knows that everybody dies and nobody knows it like the Doctor. But I do think that all the skies of all the worlds might just turn dark if he ever, for one moment, accepts it. Everybody knows that everybody dies. But not every day. Not today. Some days are special. Some days are so, so blessed. Some days, nobody dies at all. Now and then, every once in a very long while, every day in a million days, when the wind stands fair and the Doctor comes to call, everybody lives. First there were the Daleks...And then there was a man who fought them. And then, in time — he died. There are a few, of course, who believe that this man somehow survived, and that one day he will return. For both our sakes, dearest Hannah, we must hope these stories are true. StevenMoffat.net The Moff. Thrilling adventures in Time & Space. And Horbridge.